The modification or control of a process or system by its results or effects, e.g., in a behavioral response. It’s not rocket science. Feedback is as central to human development as food and shelter. It’s how we learn virtually everything—from not sticking our fingers into a flame to quantum physics—so naturally it’s an essential part of teaching and coaching. As a high school football coach, my job was to teach my players the offensive side of the game. For 95% of the time, that entailed endless hours of practice, running 20 to 25 kids through 75 to 100 complex plays designed to take or create advantage in certain situations. About 5% of the time it entailed me standing on the sidelines watching them try to execute the stuff they’d practiced while a bunch of kids on the other team tried their best to not let them do it. Feedback was always part of the equation. My fellow coaches and I always tried to tell each player the good and the bad, both in the moment and in periodic informal one-on-one meetings, as best we could. And the volume of stats we collected and shared with players even back then was pretty staggering. The challenge for us in providing feedback was twofold. First, most of it was just verbal, so it naturally went in and out of those 17 year old ears and was not shared with their parents. Second, the stuff that wasn’t verbal was literally written down on paper, and processing it into understandable, meaningful metrics was time consuming and cumbersome. But hey, we tried! Fast forward a few decades, and a lot of coaches are still trying, and still facing the same challenges. Over 18 or so years of hockey, my son and daughter have had coaches who’ve tried hard to provide at least some meaningful feedback. They did their best to hold pre- and post-season meetings, and some offered up periodic ‘rating’ sheets in an attempt to quantify what they had seen in my kids as players. But of course, none of that feedback was standardized or trendable year over year, and where those papers went 24 hours after my kids had received them is anyone’s guess. PowerPlayer gets coaches who want to collect and provide meaningful feedback off the legal pad and onto the iPad. And it’s really communicating with kids in the way they’re used to now. PowerPlayer is designed to to take advantage of readily available, everyday technology to help coaches provide quantitative feedback (metrics) based on standardized drills, and qualitative feedback (ratings and comments) that’s transformed into scores. That means PowerPlayer feedback provides opportunities for comparison, whether a player is based in Newfoundland, Texas, or Sweden, and it’s permanently stored—along with video and comments—in a player’s account, so the player and their parents (and others such as future coaches and scouts to whom they grant permission) can access it at any time. 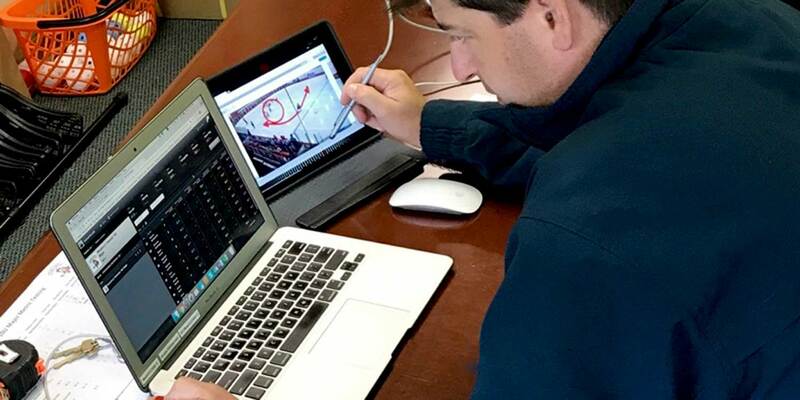 The coaches who are integrating PowerPlayer into their programs are pretty enthusiastic. Sure, that’s the kind of feedback we love, but we’re also working hard on PowerPlayer in response to things our users are letting us know we need to improve on. Because for competitive people who want to succeed, feedback is fuel.